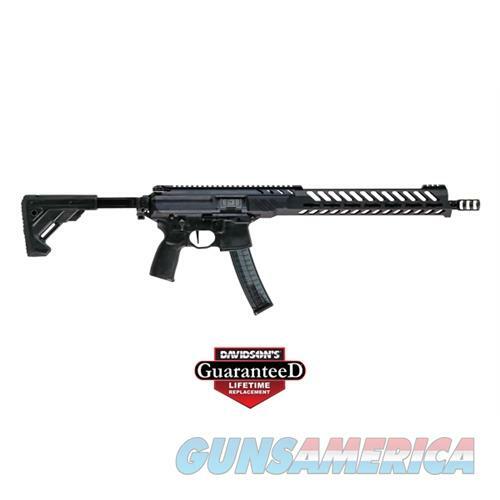 Description: SIG SAUER®MPX® PCC•Pistol Caliber Carbine (PCC) exclusive rifle of Team SIG Professional Shooter Lena Miculek •Competition ready platform •Gas piston operating system •Timney® single-stage straight flat trigger built for longevity & performance •Fully ambidextrous controls •Black hard-coat anodized aluminum receiver with oversized trigger guard •Carbon steel barrel 1:10 twist rate •Threaded muzzle M13.5x1mm TPI •3-Chamber recoil-reducing compensator •Free-float ergonomic slim-line alloy M-LOK™ handguard •5-Position telescoping folding stock •Polymer pistol grip •Polymer MPX type magazine •Ht. : 7.5" •Width: 2.5" •OAL: 35.25" •Wt. : 6.63 lbs.